All equipment is available for dry hire subject to terms and conditions. All stabiliser equipment is available with optional camera bodies for camera systems including the Alexa, Alexa Mini, Red Epic Dragon, Red Epic Weapon, Red One MX and Black Magic BMPCC, BMCC cameras. Where a steadicam sevrice is supplied and subject to availability from stock, we provide discounted hire on optional camera body bundles. We have three rigs available. 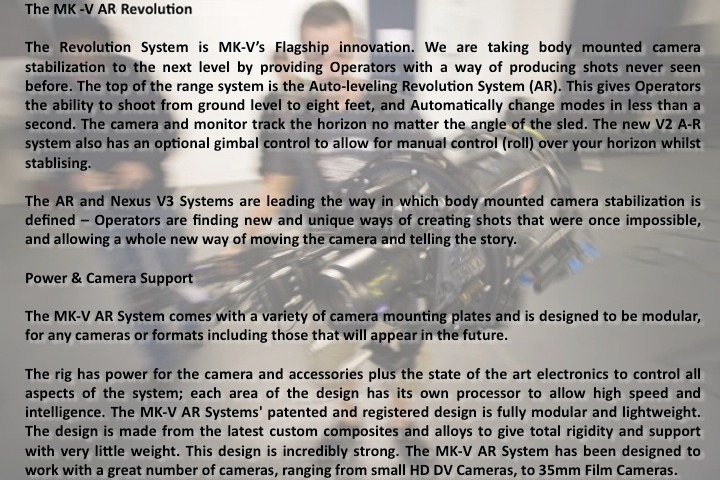 These are a 2” 4 stage (superpost) MK-V V3+ Nexus sled system which has been fully upgraded to include the MK-V Omega AR Revolution System. With all new HD electronics based on the Evolution and Nexus systems (12v and 24v) using all the standard cables and features inc. SDI. Dynamic balancing the rig is easily achieved, no matter which battery combination is chosen. The rig was designed for all cinematic cameras up to and including IMAX and will accommodate DVC/Digibeta/HD type cameras through to the heaviest 35mm and 3D rigs. Capable of being used with all film camera systems:16mm, 35mm and HD and equipped with a Betz Topstage & Tiltplate. We have two Ronin three axis rigs available together with Cinemills extension arms for flying larger/longer payloads. We also have both the CineMills and Tiffen’s own SteadiMate equipment to allow the Ronin to be utilised as a five axis stabiliser on the steadicam itself/or directly on the steadicam arm. On the steadicam arm, this provides for a compact fully stabilised rig (no footstepping) which can be operated for extrememly long takes without operator fatigue. A DJI FIZ is supplied for full remote control of focus. The MK-V Lite uses the same electronics as my Nexus system (12v and 24v) using all the standard cables and features inc. HD-SDI. Dynamic balancing the MK-V Lite is easily achieved, no matter which monitor and battery combination you choose. The Lite was designed for DVC/Digibeta/HD type cameras and the ARRI 235 & 416. The MK-V Lite is an ideal professional running rig you can use with 16mm, 35mm and HD. My Lite is equipped with a 2 stage 1.5″ post, the MK-V Genesis Gimbal (1.5″) and a Betz Topstage. The lite base can be easily replaced with the SteadyRig battery hanger for heavier configurations (shown fitted in the sled picture on this page). The TB-6 Smart Monitor is a 16 x 9 format (6″ diagonal) monitor. Microprocessor controlled, with automatic signal recognition for NTSC or PAL video formats. Electronic edge enhancement, vertical and horizontal image zoom control in and out of aspect ratio. Three channel video inputs, with built-in linearity/grayscale pattern generator. Low battery and tally light indicators, power standby and much, much more. All functions are automatically stored into nonvolatile memory for instant recall. This one is also supported by the XCS PDL on screen bubble. The V2 MK-V/Hummingbird LCD is the brightest daylight viewable LCD – sun hood not required. This monitor was designed specifically for ‘Steadicam™’ work. (PAL & NTSC – auto switching) This new V2 monitor has a 6.4″ (4:3) diagonal screen and 4:3, 16:9, 2:1 and user aspect ratios as standard. Built in frame lines, centre cross and boarder. Zoom in and out. Flip and reverse scan. And built in heaters for working in sub zero temperatures. Plus PRO compatible connections and built in Tally lights. This is an excellent 16:9 SD monitor – it is recommend for use on the MK-V AR system due to its light weight. I have a backup within my kit allowing for configuration of my second sled for a quick shift to the running rig. This is my main FI+Z system and its ‘bullet proof’! The classic FI+Z wireless lens and camera control system is known worldwide for its combination of precision, simplicity and ruggedness. It consists of a main Hand Unit, Motor Driver, a set of Digital Motors, a Micro Force zoom control, and a variety of additional controls including wireless Focus/Iris, Zoom, and F/X units. My MK-V Wireless focus system is a professional focus system with auto cal and auto anti backlash, programmable end points (within the standard range) and a speed control for super smooth iris and zooms. The WFS has digital control of Heden, FMG motors. This system has the speed and performance of the larger digital systems at a fraction of their size. My system is supplied with an upgraded FMG-6 Motor with drive gears for video and film camera focus, iris and zoom. I use this system as a backup to the Preston. We also carry Ronin FIZ systems to support the lightweight Ronin and Ronin X. The MK3a arm has an articulated elbow & reversible pin block. The weight range of the Gold Spring arm is 36-58 lbs – if you minus off the weight of the sled (which is around 8.5lbs minus battery and monitor) that should be the max capacity for everything else. The RedByte Decimator is a new, lightweight downconverter for use with digital film cameras such as the RED ONE. The Decimator not only converts from HD to SD but also converts the new 3G format to SD. Ideal for Steadicam use, my Decimator includes full cable support for power from my Nexus sled and also directly from the power out port on the RED ONE. Handsfree Transporter is an add-on/modification that provides for safe and easy “look-mum-no-hands“ operation of any Segway®. The Handsfree Transporter frees up the operators hands for camera operation, making it ideal for use by Steadicam™ operators. The HD10MD3 is a miniature digital downconverter for converting HD-SDI video to standard definition SDI and analog component/composite video. The HD10MD3 uses a full 10-bit data path and multi-point interpolation to produce broadcast quality downconverted video. In addition, the HD10MD3 converts either 1080p24 or 1080p24sf to 59.94 Hz output video using the standard 3:2 pulldown technique. The output can be formatted for either 4:3 or 16:9 standard definition monitors. Four-channel input embedded HD-SDI audio is passed to the SDI output. Housed in rugged shock resistant CNC machined aluminum housings with whip and flat antennas provided as standard. Marell Video Link has now been widely accepted as an industry standard and has proven itself time and time again over many years on a huge number of productions. The Camwave system is also available and used as a backup which utilises 5ghz WiFi technology. Both systems are capable of supporting my 7” Teletest Director’s Monitor & Case. The MK-V V2 Telescopic arms are telescopic and have rotatable mounts to allow easy and quick spinning of the monitor for low mode. Baer-Bel low-mode-cage with 4 noses for 15mm motor-rods. After you have fixed the camera on the lower plate, push the upper plate down and lock the screws. The camera is safe now. Doubles for a nice seat to sit down and rest after a heavy take! Will take cameras up to 35mm. Walter Klassen’s Vehicle Mount allows a Steadicam rig to be mounted to nearly anything. The included Mitchell plate and Manfrotto clamp with eight possible mounting angles facilitate easy mounting by a number of different methods. One of the only mounts available with end block tilting, Walter Klassen’s Vehicle Mount can tilt up to 40° to help you stay balanced in most conditions. I have four vests (two front mount and 2 klassen vests) and so a vest for every occasion! The back mount vest by Walter Klassen is custom made for me and my vest of choice when operating in most conditions. Its a state of the art vest in leather and carbon fibre and includes double ratcheting straps on both sides of the curved carbon front giving nearly infinite variations in harness fit. The curved carbon front and harness shell can be nested to make a more compact package when traveling. The Pro vest comes into its own when you need to get in to tight/narrow spaces and features infinite fit adjustments and a safety cord for emergency use when in dangerous situations.